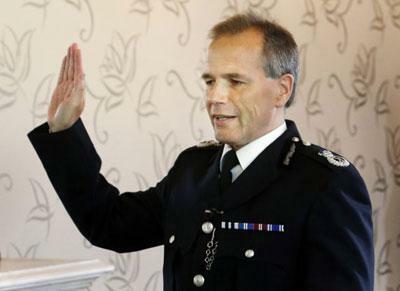 Unelected and unaccountable Generalissimo Stephen House giving a Red Hand salute or perhaps taking oath to Betty Battenburg. Offensive either way. 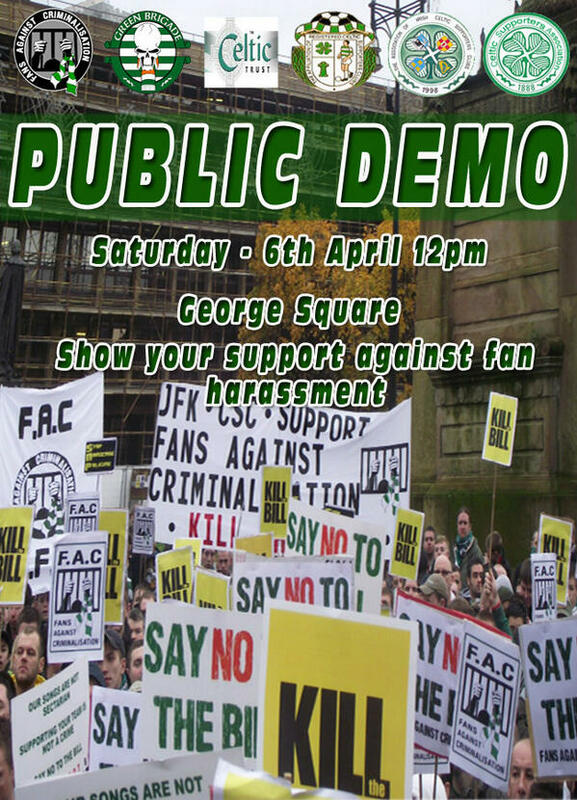 Tomorrow there will be a demonstration calling for an end to the criminalisation of football fans in Scotland. The demonstration will take place at George Square in Glasgow at 12 noon. Although organised by Celtic supporters in response to the behaviour of the police towards Celtic supporters this protest should be supported by all football fans and indeed by all working class people in Scotland. The mistreatment of football fans across Scotland is just one manifestation of the UK state’s attempt to criminalise and depoliticise the working class. The protest also occurs at an opportune moment, coming as it does on the first weekend of the SNP’s new Met of the North police force. As has been evidenced many times policing in Scotland is already out of control so we cannot blame that on the new Police Scotland force. However the move to a national police force is another move which increases state power at the expense of the working class. We have already seen the head of the new force, Generalissimo Stephen House involved in a power grab from the policing authority. Since coming to power the SNP have granted almost every item on the police wish list. From scrapping corroboration, ending the double jeopardy rule, legal aid cuts, scrapping not proven verdict etc etc all the changes disproportionately impact working class people and increase state power. The real issue here is not the Green Brigade or the behaviour of football fans it is the behaviour of the police and the abuse of state power being facilitated by political parties (and let’s remember the Labour party backed the Met of the North force). Young Celtic fans being ‘kettled’ on their way to a football match. Scotland, March 2013. The increased harassment and intimidation of football fans by the police was of course predicted following the introduction of the Offensive Behaviour Bill. The purpose of this dreadful piece of legislation is to be both broad in its interpretation but also narrow in its focus. Broad in the respect that it is worded in such a way that it is not clear to anyone what is and what is not offensive in this context. This deliberate vagueness allows the police huge scope by giving them the power to define what is and what is not offensive (to them). In another regard the target of this legislation is drawn very narrowly indeed. While claiming to want to remove politics from football it in fact introduces, in a very overt way, politics into football and into the policing of football in particular. The SNP (and other parties) are quite happy to use advertising hoardings inside football stadiums to get their political message across so it is clear they do not object to politics and football mixing. No, the real purpose here is to remove any public support for Irish republicanism from Scottish football grounds. In a mature political society the displays of the Green Brigade would have been welcomed as young people engaging in political activity. The displays might also have been heralded for their campaigning against injustice and imperialism. However in Scotland the Green Brigade displays were seen as supportive of Irish republicanism and in the new Scotland that is verboten. It is for all these reasons; the criminalisation of football fans, the demonisation of the working class and the attempt to erase from public view support for Irish republicanism and national democracy in Ireland that we must fight back. Tomorrow’s demonstration must be the beginning of a broader campaign against the UK state and its proxy government at Holyrood. The fight back begins with football but it must be based on politics, more than that it must be based on working class politics. What is required is transparency and accountability in policing and Scotland’s new Met of the North is a move in the wrong direction. Irrespective of what team you support, support the demonstration tomorrow. 12 Noon, George Square, Glasgow.